The year was 2000 and the Olympics were being help in Sydney, Australia. With America setting the bar very high with the All-American College Marching Band in 1984 and then once again featuring bands in 1996, the Australian Olympic Committee felt it was necessary to once again feature the marching arts. They decided that the only way to do it was to go big. Really big. 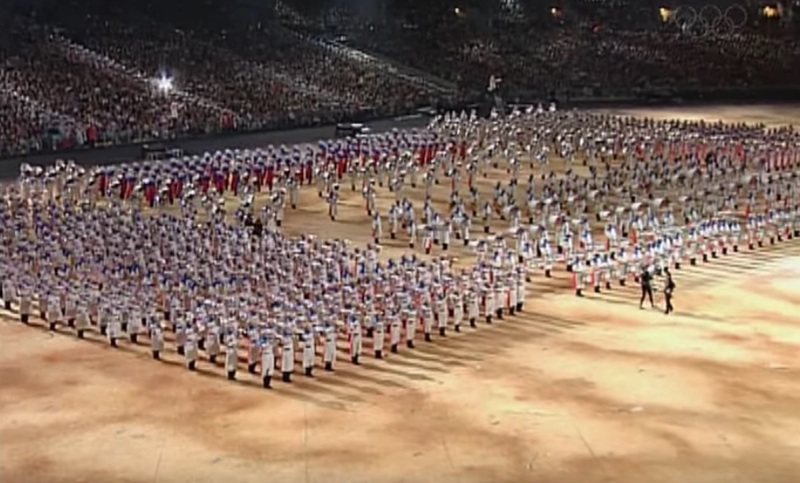 1,000 Australian marchers joined forces with 1,000 international marching band members to form the Olympic Band in honor of the year 2000. Their performance of "Ode to Joy" features the largest company fronts we have ever seen. Make sure you watch their full performance to see the fronts at the end. The creation of this band actually was part of a bit of controversy. Originally the band was to feature 1300 American marchers, 200 Japanese marchers and 500 Australian marchers. The Australian band community protested and at one point the mega-band almost didn't happen. They were upset that so little Australian band members were chosen to perform. So, the committee consulted and settled upon raising the number of Australian musicians to 1000. What an amazing moment for the marching arts.